Looking for a new house or remodeling the one you already own? Decisions of all kinds can hit you from every direction. Even the smallest details seem to matter in creating the giant masterpiece that is your home. One of the hardest decisions is choosing what kind of flooring would be what’s the best fit you and your family needs. With options like hardwood floors, tile, laminate flooring, carpet and more, this decision can quickly become overwhelming. However, one option that seems to outlast all the others is vinyl flooring. Vinyl is used more often than you’ve ever noticed. From building materials, car parts to food packaging and even medical equipment, it’s no surprise that vinyl would be used as a flooring option. Vinyl flooring is a great alternative to hardwood floors, tile… you name it. Its material allows itself to take on virtually any design, even to look like its competitors. This cost-effective option first became popular in American households in the late 1950’s and has continued to be a favorite since. With recyclable properties and improvements in emissions, vinyl flooring is continuing to flourish in the flooring market. If you’re still unsure about vinyl flooring, here are some benefits to consider in your decision. Adaptable. Vinyl flooring provides a variety of design options. It comes in a variety of colors, patterns and styles that can have a lifelike ceramic or porcelain feel to it. Many vinyl flooring options are made to appear as wood grains or even include grout lines to mimic authentic tile. Affordable. Though they may range in cost, most vinyl flooring options are significantly cheaper than other flooring alternatives. Most people choose vinyl sheet or vinyl tile, but even luxury vinyl is a comparatively affordable upgrade. Whatever you choose, you’re sure to get what your moneys worth. Comfortable to walk on. Most vinyl flooring is made with a thin layer of foam, resulting in a softer surface than wood or concrete. Because there is a little more malleability to its material, vinyl flooring can help homeowners with joint issues or people who do tasks that require them to stand for long periods of time. Vinyl flooring’s flexibility can also reduce noise, which may also be a plus for families with children or pets. Durable. If properly installed and maintained, the life of vinyl flooring can last for over 20 years. Most solid vinyl, vinyl tile and fiberglass-reinforced vinyl sheets are scratch-resistant, stain resistant and pliable. If any foundation problems were to ever occur in your house, the vinyl will last because it can bend with the foundation. Easy to clean. Vinyl is the best option when it comes to cleaning. A low-maintenance cleaning routine of a regular sweep and an occasional mop is all you’ll need to have sparkling floors. You also don’t have to worry about what cleaning materials to use as much as other flooring options because vinyl is so durable. Stain resistant. Because of vinyl’s durability, it can take on spills that other flooring alternatives can’t. Most topcoats of vinyl cause spills to bead up for quick clean ups. For most owners with kids or pets, this is a huge bonus. Stays warm. The properties of vinyl cause it to not be affected by cold temperatures. Therefore, it stays warm in even the coldest of winters. However, heat can affect the flooring. That is why vinyl flooring should only be installed indoors to avoid any warping. Water resistant. Like being resistant to dirt, scratches and stains, vinyl is water resistant. Because of its nonporous material, vinyl doesn’t absorb moisture like hardwood and laminate. For extra protection, many vinyl flooring options come with waterproof backings made of plastic or cork. Since spills and splashes won’t cause it to warp, vinyl flooring is the perfect option for bathrooms, kitchens and mudrooms. 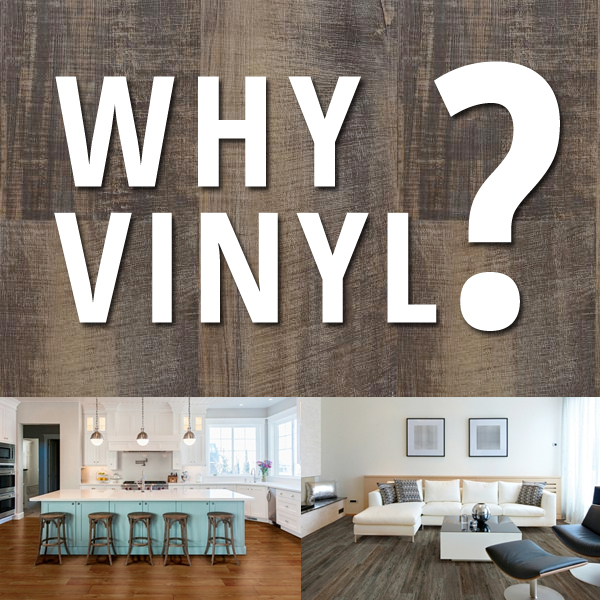 For many people, vinyl is the perfect all-purpose flooring option when considering factors such as budget, the type of room, expectations and so on. It’s inexpensive, doesn’t easily wear and comes in a variety of design options. It can also be repurposed from installation and production scraps, contributing to global sustainability, minimizing the impact on our environment. The benefits of vinyl flooring far outweigh its investment and lasts for years. It may be exactly what you and your family are looking for. If you have any questions about vinyl flooring, please give us a call at (210) 496-2121 or click here for a free estimate.